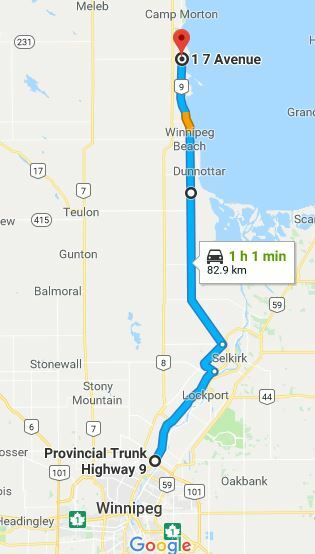 PTH 9 runs south-north from PTH 101 (Perimeter Highway) in the RM of West St. Paul through Selkirk and along the western shore of Lake Winnipeg, ending in Gimli. Click here to show the route. 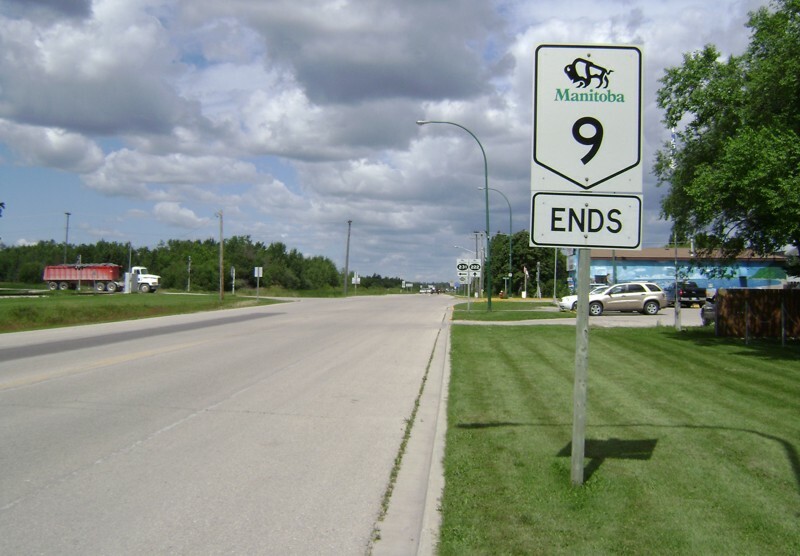 Between Winnipeg and Selkirk, PTH 9 carries mostly residential and commuter traffic and serves the growing number of housing developments in between the two cities in the RM of West St. Paul and the southern part of the RM of St. Andrews. North of Selkirk, the highway serves the many small communities along Lake Winnipeg and sees its highest traffic during the summer months from tourists and seasonal cottagers. Between Winnipeg and Selkirk, PTH 9 has two lanes in each direction and is divided most of the way between PTH 44 and Selkirk. North of the southern junction of PTH 9A, it reverts to a two-lane undivided highway all the way to Gimli. Southern Terminus: Junction of PTH 101 and Route 52 (Main Street) in the RM of West St. Paul. Northern Terminus: Junction of PR 222 and PR 231 in Gimli. Historical Note: The portion of the route between PTH 101 and PTH 44 was originally designated as PTH 1 and part of the Trans-Canada Highway. This highway was renumbered as PTH 4 when the present-day PTH 1 was constructed east of Winnipeg and it ultimately became part of PTH 9 in 1968. Prior to 1968, PTH 9 followed Henderson Highway, present-day PR 204, from Winnipeg to Lockport. RM of West St. Paul 0.0 Junction of PTH 101/Route 52. Village of Middlechurch 1.0 Traffic light at Grassmere Road. This is the former eastern terminus of PR 220. Village of Rivercrest 3.7 Traffic light at Allenford Drive. RM of St. Andrews 8.6 Junction of PTH 27/PR 238. There is a traffic light at this intersection. RM of St. Andrews 13.3 Junction of PR 410/St. Andrews Road. There is a traffic light at this intersection. Village of Lockport 16.2 Junction of PTH 44. There is a traffic light at this intersection. RM of St. Andrews 18.6 Entrance to Lower Fort Garry National Historic Site. RM of St. Andrews 19.4 Junction of PTH 67. RM of St. Andrews 20.8 Junction of PTH 9A. PTH 9 reverts to a two-lane highway. RM of St. Andrews 21.1 Uncontrolled railway crossing. RM of St. Andrews 23.1 Junction of PR 230/McPhillips Road. City of Selkirk 27.1 Intersection of Manitoba Avenue. RM of St. Andrews 28.2 Junction of PTH 9A/PTH 4. There is a traffic light at this intersection. Village of Clandeboye 38.3 Junction of Road 84N/Clandeboye Road. This is the former PR 515. Village of Petersfield 44.8 Junction of Road 88N/Petersfield Road. This is the former PR 413. RM of St. Andrews 54.7 Junction of PTH 17. RM of St. Andrews 59.7 Junction of PR 232. RM of St. Andrews 61.3 Junction of PR 225. Town of Winnipeg Beach 67.4 Junction of PR 232. Town of Winnipeg Beach 67.8 Uncontrolled railway crossing. Town of Winnipeg Beach 67.9 Junction of PR 229. This is Road 102N that separates the RM of St. Andrews from the RM of Gimli west of PTH 9. Village of Sandy Hook 71.3 Junction of PR 519. RM of Gimli 74.8 Intersection of Husavik Road (Road 106N). RM of Gimli 78.2 Intersection of Siglavik Road (Road 108N). LUD of Gimli 81.5 Intersection of Gimli Park Road/Colville Drive (Road 110N). LUD of Gimli 82.2 Intersection of Centre Street. There is a traffic light at this intersection. LUD of Gimli 83.1 Junction of PR 231/5th Avenue North (Road 111N). PTH 9 ends and continues north as PR 222.